Bristol Computer Support make every effort to fix your computer problems remotely. The methods we select are tried and tested. The solutions are secure, as long as you allow us to set strong passwords and follow procedures to limit access. Remote Support typically is a small computer program that is installed. It allows another computer on the network or the internet to see the screen and drive the mouse and keyboard. You can explain the issue and watch as the engineer deals with the issue. This only works when the internet is available. 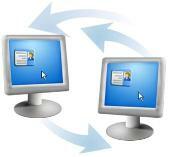 Teamviewer and Zolved are both internet based remote support tools. You can download the program, install it, and set the password. The engineer (Bristol Computer Support) will run the version of the program that will take over your PC. It uses a server on the web to identify your PC based on the ID codes you give us. Most firewalls allow this, but some do block it. VNC has an extra phase where BCS will have to setup a VPN connection prior to remote controlling your PC - two levels of security. Some antivirus programs like to mark this application as "malicious" and remove it.